yes, golf. 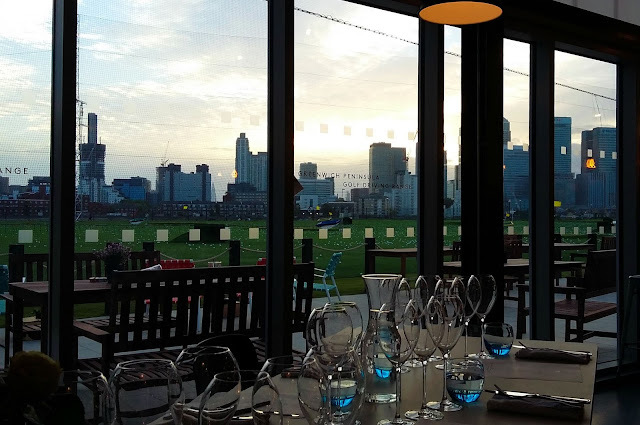 to help celebrate greenwich peninsula's newest sporting addition, i was cordially invited to a night of wine and food paring at vinothec compass, with a host of london's finest foodies. golf? yes, golf. 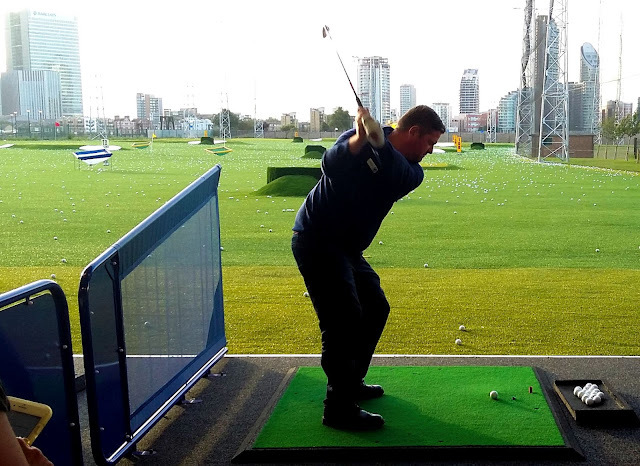 a sixty-bay strong, two tiered driving range exists in north greenwich, and overlooks canary wharf, and has done for just over a month now. and, with 120 balls setting you back a measley £12, what a way to let off some steam after a hectic week. 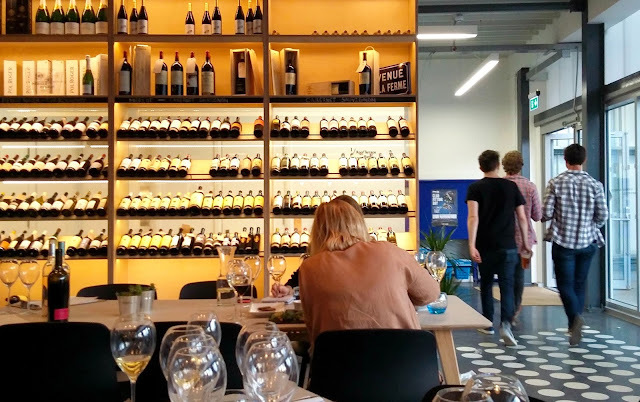 i stood and watched the others perfect their techniques, with the glass of pine and pastel de nata-scented pol roger champagne in my (good) hand being my main priority - well that, and the doctor's note giving me permission from p.e. until my finger heals, of course. 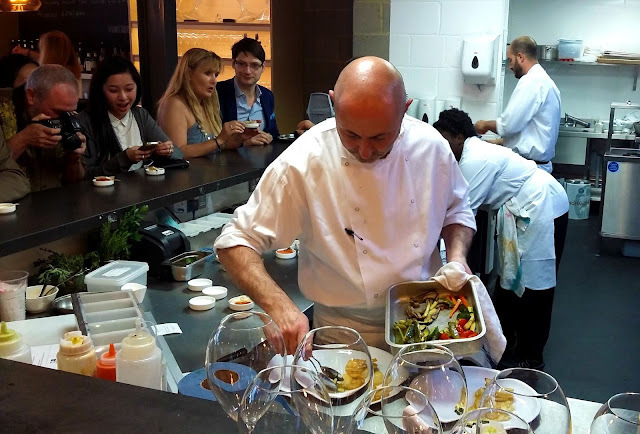 after a brief demonstration from some of the pros, we were ushered inside and kitchen-side to watch head chef jordi rovira cook us up some baby squid, tomato and coriander tapas. this was paired nicely with a bulgarian chardonnay, imported by our two hosts - arnaud and keith of vinotec compass. 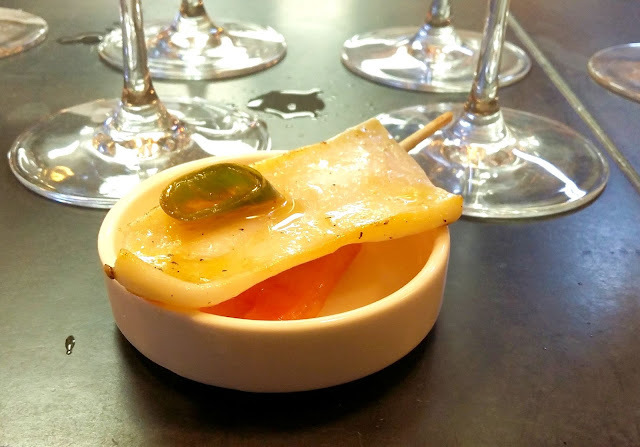 exhausted from our strenuous exercise, we gathered at the two long tables in the centre of the dining room, and sat for the second of six courses - smoked trout salad created by chef jordi's sous chef, dani rodriguez navas (michelin-star trained, no less). the surprisingly tasty dish combined labneh, black olives, asparagus, citrus vinaigrette and fresh oregano with salmon roe, was not like any salad i've ever had before. it was paired with what i was sure was a blush rosé, but what i was assured by the experts was not. 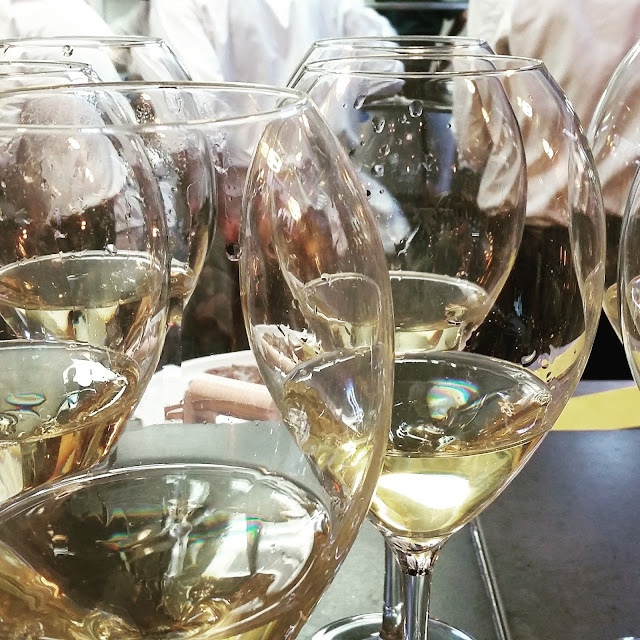 the moroccan vin gris was absolutely delicious, regardless of what colour it was. 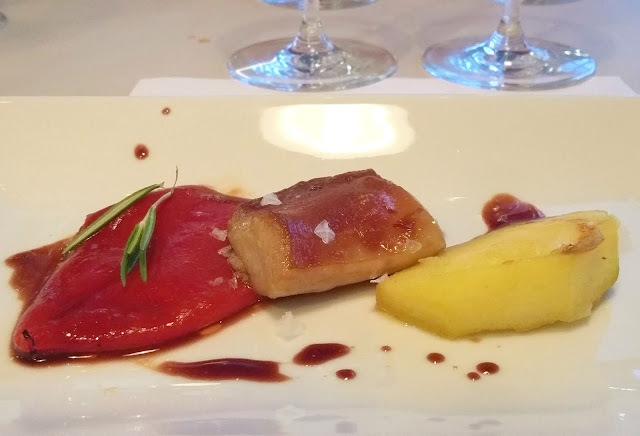 next up was the course i had been waiting for all day - the juicy suckiling piglet belly served with charred piquillo pepper and a tart slice of apple, and paired with (something i was not looking forward to) a slightly chilled (arnaud believes that room temperature - combined with global warming and central heating, is not what it once was) red, naturally, for pork. i'm not a red drinker so my table-mate tara and i traded wines for this course. i prefer to drink what i like, not drink what is right. the next course was a cod confit with romesco sauce, served with dido 2013 from monstand vineyards close to where chef jordi grew up. 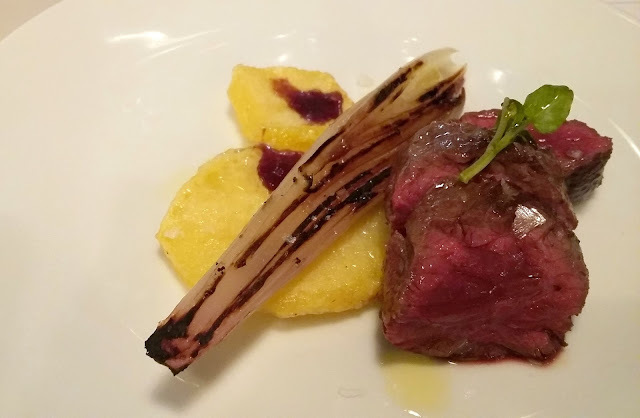 surprisingly, the wine chaps decided to stick with the white for last of the main courses - a longhorn onglet served blue (i prefer my steak charcoaled, but this one.. was delicious still). because of the initial shock from the tables at the suggestion of white, keith ad-libbed and grabbed a grecian red off the shelves for those not satisfied with the spanish white. which i definitely was. and lastly, but by all means not leastly, was dessert; a deconstructed vinothec cheesecake, thusly named for its home in the south london driving range slash restaurant slash tasting room. the cheese itself was 75% fat and ermergerd it was thick and creamy and like, out of this world. served with a crumbly biscuit base and poached peach. absolutely bloody marvellous. might have even eaten the partly finished one to my right. don't know what wine was served with that - was too busy eating cake. so, if this is golf, then count me in. i could defffffinitely take up golf. 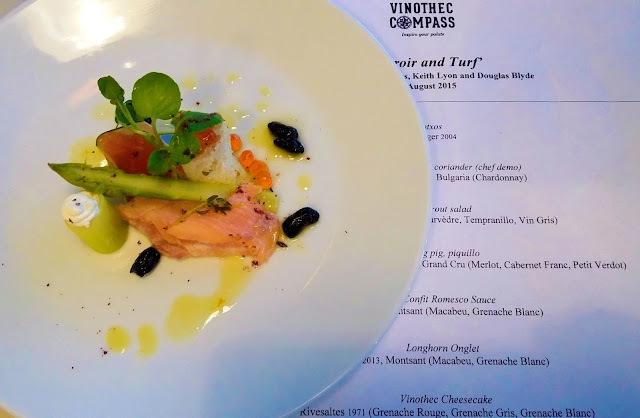 a haaauuuge thanks to co-owners arnaud and keith at vinothec compass for sharing their lovely wines, and chef jordi for sharing his well-curated menu with us. and as always, a massive round of applause to sommelier wonder douglas blyde, for continuing to invite me back to events that contain no less than six glasses of wine over dinner. what a legend. so, fancy a round? or, a drive? a hit? if you know the correct terminology, points to you.